During WWI, Nurses from around New Zealand willingly put their hand up to go and care for the soldiers engaged in the battles of World War One. Wherever their base - in the fields, hospital ship or England, among them were nurses from the Thames-Coromandel area. Comprehensive information on New Zealand Military Nursing is available on the web and in book form. The Treasury also has information on WWI that includes nurses from Thames Hospital. Below is a list of the known nurses so far identified as having trained, nursed or lived in the area. If you have any information on these nurses, can you please contact me or leave details at The Treasury, Thames. RED CROSSES AND WAR MEDALS. 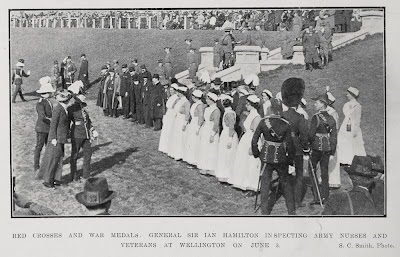 GENERAL SIR IAN HAMILTON INSPECTING ARMY NURSES AND VETERANS AT WELLINGTON ON JUNE 3.